The Pandora’s Box has opened and what comes is not something to cheer about. Yes! We are talking about the latest Panama papers leak, the most sensational leak of documents that have stunned the world. The Panama papers leak shows the way the powerful and the rich people of the world hide their wealth. Before moving on to the details of the Panama papers leak, it is essential to understand that what these papers are. The Panama papers are documents that were in possession of the law firm Mossack Fonseca, which is based in Panama. The firm offers legal advice, services and research for various jurisdictions that include Panama, Cyprus, Belize, Seychelles, British Virgin Islands, Costa Rica and several others that are mainly considered as tax havens. The leak of which there has been so much hype since the past two days amount to a staggering 11.5 million confidential documents that have legal as well as financial information. The papers date back nearly four decades when the firm Mossack Fonseca was established. It contains the financial information about personalities from all over the world that have laundered their money somehow and evaded tax in their countries. Now the important question as to who all have been named in these Panama papers leak arises. It seems that over the period of forty years, some very well known names from the political, sports, entertainment and other arenas have formed shell companies through Mossack Fonseca and laundered money. The Panama paper leak has shown links to a dozen heads of state and government. The names also include some 60 associates and relatives of the heads of state, politicians, sports personalities and some from the film fraternity. The names include associates of Vladimir Putin, Russia’s President, brother-in-law of Xi Jinping, President of China, Mauricio Macri, President of Argentina, David Cameron’s late father, Petro Poroshenko, President of Ukraine, three of the four children of Nawaz Sharif, Pakistan’s Prime Minister and Sigmundur Gunnlaugsson, Iceland’s Prime Minister to name a few. What is wrong in these cases? Since tax havens have existed from a long time, why there is such a hullabaloo over the Panama papers is the question that is being raised by money. It is true that tax havens have always existed and that there are legitimate ways of keeping money in these tax havens. However, the problem here is that the firm hid information about the owners of the money, the source of origin of this money and that the owners avoided paying taxes on this money in their countries. The shell companies through which the money has been laundered are the real culprits. There is no real business going on in these companies except for the money changing hands and this is what is wrong here. The German newspaper Sueddeutsche Zeitung was first approached by an unknown source regarding the handing over of these documents. The newspaper shared the information and the papers with International Consortium of Investigative Journalists (ICIJ). The duo along with several journalists from around the world analyzed the documents over a year and then made them public. Snapchat posted a blog article about what happened and how the data was stolen from the company. In the post they highlighted the incident was isolated and there are no other breaches in the system, which may worry employees and users. They also added no user suffered from the incident. Snapchat stated they contacted the FBI and offered the affected employees, both current and past, Identify theft insurance for two years, to compensate for the damages. The company stated they’ve reinforced their “rigorous” safety and security training programs, to prevent similar incident from happening again. The hacker or group of hackers who conducted the attack on Snapchat was/were not yet identified. The attack used a method called “spear phishing”, which targets specific persons. This type of attack is aimed towards a specific person, instead of random users and it’s more dangerous than other types of attacks. Despite their already “rigorous” training, Snapchat suffered hacker’s attacks in the past: in October 2014, the company was involved in the scandal of naked celebrity photos leak. More than 98K of private photos and videos were made public. Snapchat didn’t said what type of employee information was leaked, but given the fact it was payroll information, the name, financial information, salary, address and email are definitely among the data made public. However, Snapchat can breathe easy – there were cases when the companies had a lot more to lose from such attacks. For example, Ubiquiti Networks sent a $46.7 million payment after receiving an email from someone impersonating their CEO. This attack shows that not even millennials are safe from hackers; until couple of years ago, it was believed only old persons, who are unfamiliar with the computer can be hacked. The reality had proven that even high tech millennials, who are familiar with phishing techniques, can be fooled. Snapchat works on the principle of deleting sensitive content, at least this is how it was at first. Users can exchange messages, text and video content, then the content is automatically deleted, to keep the data safe. But last year, Snapchat changed its policy and announced they will be saving images, which stirred a lot of anger among users. Apple filed a motion to cancel the district order which asks them company to create a software which can break the security of their phone in the San Bernadino case. The motion states the case is not only about Farook’s phone, but about the Department of Justice and FBI seeking a way to break security and force companies like Apple to create a backdoor for them on their devices. This is Apple’s first official response since the case started. The case started with a terrorist attack; Syed Farook and his wife killed 14 people, injuring 22 more in the bloodiest terrorist attack since 9/11, as it was called. Before the attack, the two had destroyed their personal phones, but Farook’s work phone, an iPhone 5C with iOS 9, was not destroyed. On 16th of February a federal judge ordered Apple to assist FBI in cracking the phone, creating a software which would allow the government to disable all the protections on the phone and access the content freely. Why did the case became so notorious? Apple refused to create the software FBI asked for, believing this would jeopardise privacy and security of millions of iPhone users around the globe. Now Apple is asking for the case to be taken to the Congress, as they say government is asking for a power which was withheld from them by the American nation. Tim Cook, CEO of Apple, states that FBI forced the case into the courts, which are not able to deal with such a major case, so they want the Congress to settle the case. Moreover, in the past, the Congress refused to pass similar acts and orders, refusing to grant the government the power they are seeking. The stakes are high in the Apple vs. FBI case, as the decision will affect millions of iPhone users across the world. On the other hand. FBI and the government states they are asking this software to prevent and fight terrorism, which is a global plague. Despite the public seems to part with FBI, Tom Cook insists the creation of such a software would put a heavy burden upon IT companies and would violate Apple’s First and Fifth Amendments regarding the user’s right to privacy. Moreover, this would create a precedent and will tempt FBI and other authorities to abuse their newly-found power over and over again. What about other governments? Russia, China, even North Korea or Iran? What will happen when they will use this software to break the people’s phones and access their information? Cook sees the company as being in an incredibly ironic and uncomfortable position, as they feel they are fighting the government on a matter they ought to protect: civil liberties. He is willing to go all the way to the Supreme Court and the President, in order to settle this case, considered to be of maximum importance for Apple, as well as the IT world. Apple is not alone in this battle; other large companies plan to back Apple. Microsoft, Facebook, Google and Twitter are only the most notorious companies on the market which spoke about this case and made their intentions to support Apple clear. Behind them, there are many more companies which are filing their complains and opinions. Regardless what will be the final decision in this case, it will affect the way we see our online and mobile privacy, as well as how we use our devices. Most important, it will reshape digital privacy laws and policies. But for now, we have to wait and see where it all goes from this point. The folks at OnePlus want to celebrate the days between Christmas and the beginning of 2015 by bringing you a contest with 7 days of giveaways. Each day from Friday the 26th through the end of the year, OnePlus will be giving away a new item. Vinyl skins and even a brand new One are on the list. This is a contest, so you’ll want to put on your ‘oh no, not this again’ face. Luckily, it looks like OnePlusand their partners are keeping it pretty tame so far, asking for social media shares, fill out a form and to keep your fingers crossed. Best of all, the contest is open to all countries. Day one was a code for a free copy of FlowHome Launcher. Day two was for 100 dbrand skins for your OnePlus One, or a brand spanking new Silk White 16GB OnePlus One of your very own. If you want to get in on the 7 days of giveaways from OnePlus, and to find out what is up next in the contest, head on over to the OnePlus forums. They post all the particulars for each daily contest on the day, so you’ll need to check back frequently. What do you say, are you up for another round of OnePlus contests? NEW DELHI: World’s biggest software maker Microsoft’s chief executive officer Satya Nadella met Indian Prime Minister Narendra Modi on Friday in the national capital. 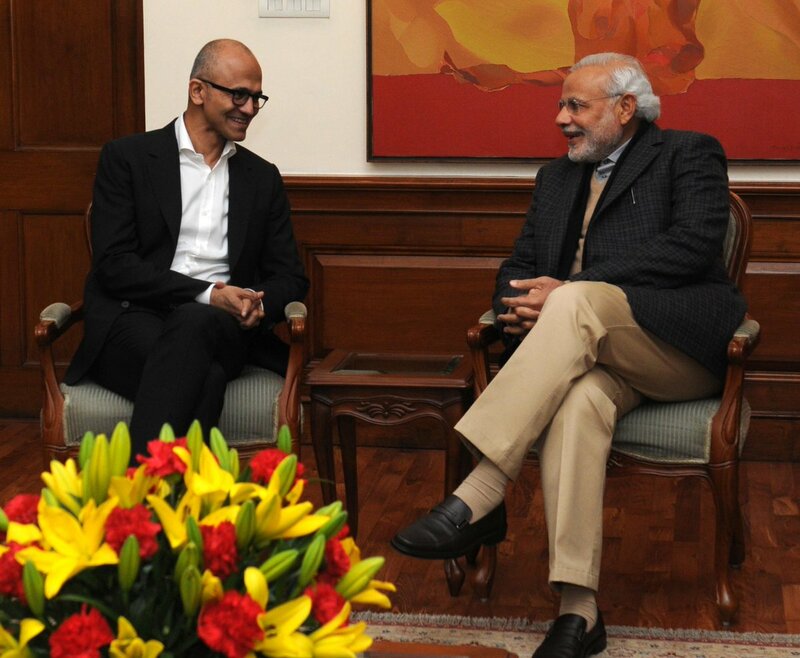 He is the third major tech executive to meet PM Modi, after Amazon’s Jeff Bezos and Facebook’s Mark Zuckerberg. “It’s always fantastic for me personally to be in India and the conversation I had with the minister was wide ranging,” Nadella said here after meeting Ravi Shankar Prasad, the union minister for communications and IT. “I have requested him to consider electronic manufacturing in India. I have also requested that Microsoft has a great profile in the field of social services, (and) digital literacy can be promoted. We had a very purposeful exchange. I am very happy and I warmly welcome him,” Prasad told reporters after the meeting. Licensing its brand is a strategy in keeping with the radical restructure that helped Kodak exit bankruptcy last September. The company spun off or shut down its various consumer divisions (including its digital photography team) and is instead concentrating on commercial printing. It won’t be the only struggling firm trying to jump on the mobile bandwagon either: back in September, Panasonic unveiled the experimental Lumix CM1 smartphone, equipped with a large sensor and Leica lens. Kodak can get people interested with its name alone, but it’ll have to contribute more than just branding to actually win customers’ respect. Update: It’s official — Sony will release The Interview online at 1PM ET today through YouTube, Xbox Video, and others. It’ll be $5.99 to rent and $14.99 to own. Not only will The Interview be available in select theaters this Christmas, it’ll also be available for everyone online. First reported by CNN’s Brian Stelter and now corroborated by multiple outlets, YouTube has “tentatively agreed” to make it available as a rental. Sony is additionally in talks with other streaming outlets, so it wouldn’t be exclusive (according to Recode, that list includes Google Play store and Sony’s own website). On Tuesday, the Alamo Drafthouse revealed that Sony Pictures would now allow the film to be played in select theaters. As the day progressed, the number of theaters playingThe Interview grew into the hundreds. Notably, however, no major US theater has joined the list. The question, until today, was how Sony would get the movie in front of the public’s eyes. In that very same CNN interview on Friday, Lynton said that “there has not been one major VOD distributor [or] one major e-commerce site that has stepped forward and said they’re willing to distribute this movie for us.” He added, “we don’t have that direct interface with the American public so we need to go through an intermediate.” That statement suggested that Lynton had entirely overlooked Sony’s very own Crackle streaming video service, which is home to a number of Sony Pictures films. Following threats of physical violence, all major theaters dropped the movie and Sony later canceled the premiere altogether. According to CNN, the hacking group last emailed Sony on Friday, threatening to release more data unless it (somehow) removes all signs that The Interview ever existed. The film’s official Facebook and Twitter pages, along with the clips from Sony Pictures’ YouTube channel, did in fact disappear for a few days. Everything returned on Tuesday, however, when independent theaters started announcing Christmas Day showtimes. In a shocking moment of surprise, Samsung managed to push out a Lollipop update to the Galaxy S5 just weeks after the OS build went live. This came as a dramatic shift from the past, wherein the updates were usually met with significant delays. Still, Galaxy Note 4 and Galaxy Note Edge owners are no doubt ticked off their ticket to candy land hasn’t arrived yet. While the videos basically speak for themselves, SamMobile is reporting that these three devices will not be receiving Android 5.0.0, but instead be updated straight to 5.0.1, a build that consists largely of bug fixes but also add slow/fast motion video recording. Despise these videos showcasing software that is rather well along the way towards release, it’s still not finished, and thus there’s a burning question on everyone’s mind: when will it drop, and who will get it when? Some reports point to a January release date for the Galaxy Note 4. Leading is all about motivating your team members in perfect direction to complete the vision. In business a leader play very important role. Many factors relate to the business depend on a single leader. Members of your business team working on the direction guided by a leader, they had faith and trust on a leader and that is why it’s very important for a leader to guide them well so that they can follow you. A leader knows that he has to lead but it’s very tough and challenging to lead actually. He or she needs to be very clear the way of leading a team to complete the vision of the firm. To become a successful and effective leader, make strong relations with your team members inside the office and outside as well. Understand the strengths of each member and bridge the working relations accordingly. As a leader you need to answer many thoughts of many people and therefore you need to understand the actions of your team members internally and externally. Most of the leaders are trying to change some little things in the office, less than 20 percent of leaders are found to be successful in experiments. Leading is all about motivating your team members in perfect direction to complete the vision. Learn something from day to day activities and improve errors you faced during leading, in the end you will get your employees working in right manner.